In this report, you’ll find an overview of the changing trends in residential real estate and rentals. 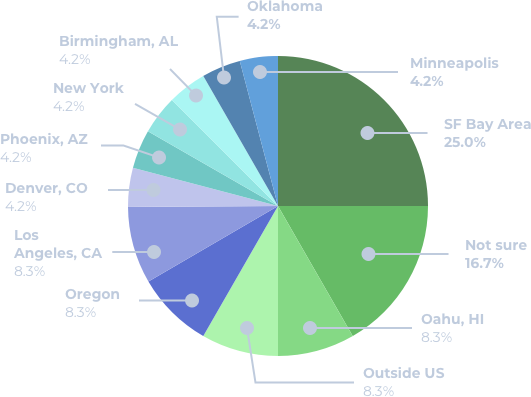 We focus the study on the two of the country’s hottest markets and those in which Onerent operates–San Francisco Bay Area and Seattle. The purpose of this study is to highlight not only rental pricing performance, but also certain trends related to offline data, such as market leasing performance, cost of maintaining a rental, and more. Our data comes from our experience serving over 30,000 renters and landlords, along with leasing and managing over 3,000 properties. We also surveyed two hundred landlords and renters on their thoughts on the trends of rentals. We hope you find the Onerent Rent Report of Quarter 4, 2018 informative and useful in building your knowledge of real estate and the rental market, whether you’re a homeowner, renter, real estate professional, or journalist. 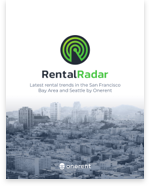 Onerent was co-founded in 2014 by Greg Toschi, Rico Mok, and Chuck Hattemer and is headquartered in San Jose, California. With over 20 combined years of real estate and technology experience on the executive team, the team was a first-mover in the technology-enabled property management space for residential real estate. They’ve also pioneered the first decentralized property management operation, serving four major metro markets with only one operational back-office. The company’s unique approach has allowed them to build one of the fastest, organic-growth, rental services firms in the US and they now lease and manage a portfolio of over $1 billion in residential rental properties. The company is venture backed by Renren Inc, XG Ventures, Jeff Dean (Google Chief of AI), Bob Moles (Former Trulia Board Member), Michael Zee, Chris Chin, and other Google executives. The Onerent Rental Index is a 10 point scale that analyzes the rental potential in a market. We’ve created a different scale for homeowners and renters. Markets close to a “1” rating signifies that the current rental market is a poor area to invest in for homeowners. Homeowners can expect their monthly returns to be lower than a market rated “10”. For renters this means the market is less competitive and easier to find housing. Renters can expect to see lower rental prices and more inventory on the market that stays longer on the market. Markets close to a “10” rating signifies that the current rental market is a lucrative area to invest in. For renters, this means the market is more competitive and more difficult to find housing. Renters can expect to see higher rental prices or having to wait in a queue of several renters for their application to be accepted. The San Francisco Bay Area had an average of 7.49 from July 2016 to September 2018. As shown in the bar graph below, the Onerent Rental Index of San Francisco Bay Area experienced peaks and valleys ranging from a low 6.13 in July 2017 and September 2017, to a high 9.36 in April 2017. 2017 had two low points in the rental housing market, one in January 2017 and another around September 2017. This can be due to the holiday season slowing down the market. Seattle had an average of 4.01 from July 2016 to September 2018. The Onerent Rental Index of Seattle did not experience as severe peaks and valleys. It ranged from a low 3.35 in March 2018, to a high 5.11 in back in August 2016. Seattle had a more consistent rental market. The rise and declines in our index were more gradual. As of the beginning of Quarter 4 in 2018, Seattle can be seen in gradually declining in the Onerent Rental Index. The average rent per region for Quarter 2 and Quarter 3 was calculated. In the San Francisco Bay Area, the average rent rose by $578 between Quarter 2 and Quarter 3 of 2018. In Seattle, the average rent rose by $143 between Quarter 2 and Quarter 3 of 2018. 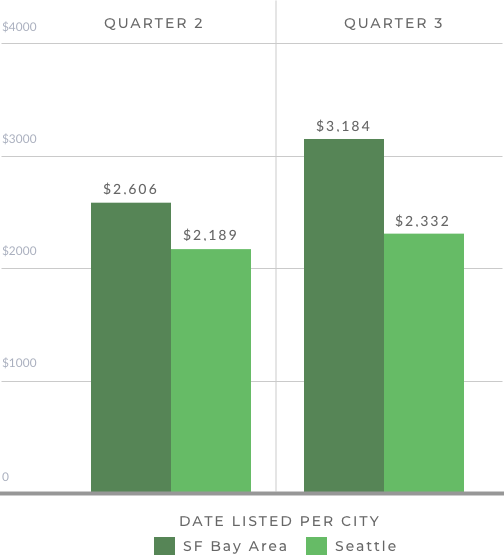 In Q2, San Francisco rental prices were 19% higher than Seattle’s prices on average, at a difference of $417. In Q3, San Francisco rental prices were 36.5% higher than Seattle’s on average, at a difference of $852. Almost a 2x increase from Quarter 2. We’ve measured the average target rent by housing size. This calculates how much rental properties are listed for in San Francisco Bay Area and Seattle cumulatively in Quarter 2 and Quarter 3 of 2018. The bar graph trends higher as the number of bedrooms increase. The largest percentage increase is between 1 and 2 bedrooms in both the San Francisco Bay Area and Seattle. The price increases start to plateau as more bedrooms are added. You can expect to pay around $1,352 per bedroom in a 5 bedroom SF Bay Area home and around $688 per bedroom in a 5 bedroom Seattle home. 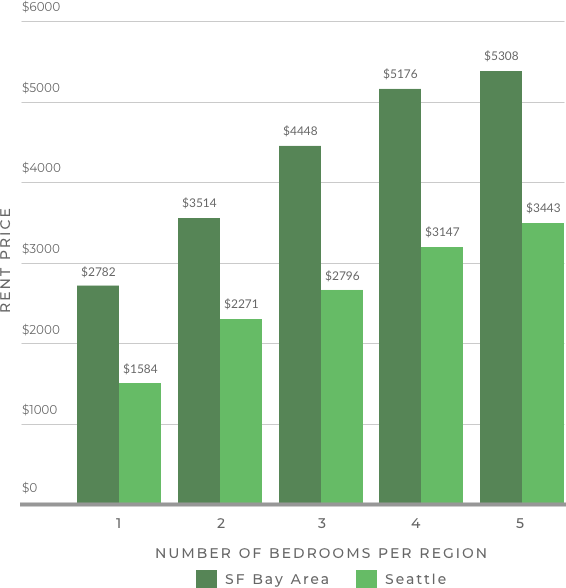 As you rent a larger house in both markets, the dollars spent per bedroom decreases. 1. When are you planning to move to a different city? 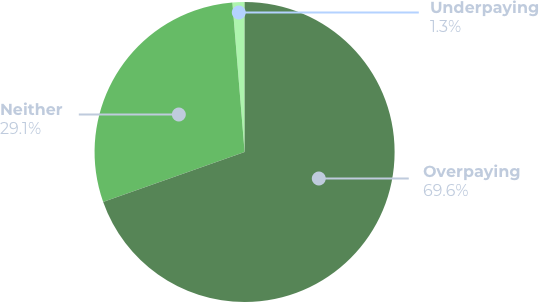 70.9% of respondents selected they do not have plans to move cities in the near future. 13.9% of respondents plan to move within 2 years. 10.1% plan to move within 3 years. 5% plan to move within 6 months and 12 months. This measurement places renters in a position of permanance in their rental city. Renters have plans to settle down roots in their rental city, compared to the previous assumption that renters bounce from city-to-city. 2. Which city would you most likely move to? Of the respondents who selected they will be moving to a new city from question 1, 41.6% plan to move to states outside of California. 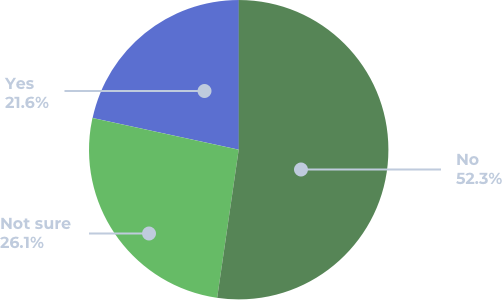 8.3% plan to our outside the United States. 33.3% of respondents plan to stay in California but will choose to move to a different city. 16.6% have plans to move however are unsure of where to settle down. It is unclear whether or not the motive for moving cities is due to a career change, priced out from rent, or rent control because all responses were anonymous. We can conclude renters are favoring to move to metropolitan areas instead of suburban areas. 72.1% of respondents who live in the San Francisco Bay Area are not planning to move cities. 66.67% of respondents who live in Seattle are not planning to move cities. 3. Do you think you are overpaying or underpaying for your current rental home? The overwhelming majority of renters believe they are overpaying for their current rental home. One respondent believes they are underpaying for their rental. A third of respondents believe their rental home is accurately priced. 63.93% of respondents who live in the San Francisco Bay Area believe they are overpaying for their current rental home. 88.89% of respondents who live in Seattle believe they are overpaying for their current rental home. No one in Seattle think they are underpaying for their current rental home. 4. How optimistic about the 2019 housing market? 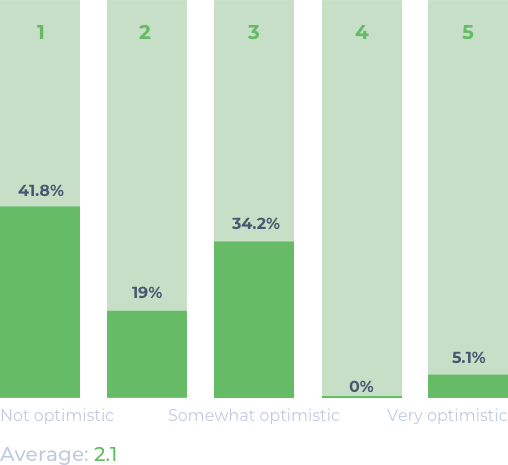 We’ve asked respondents how optimistic they are about the 2019 housing market. 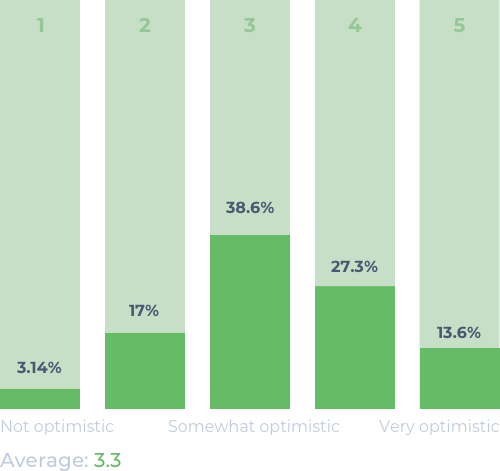 On a scale of 1 to 5, the average came in a 2.1, trending towards the “Not Optimistic” and “Somewhat Optimistic” side. This is not a surprise considering the majority of respondents in question 4 believed they are overpaying for their rental. With low optimism levels in the renter demographic, we can safely assume renters are not optimisic and are not prepare to purchase a home of their own in the near future. With the rising costs of living in metropolitan areas, it is more difficult for millennial renters to save for a downpayment of a home. 5. How much do you think the rent prices will increase in your location in 2019? 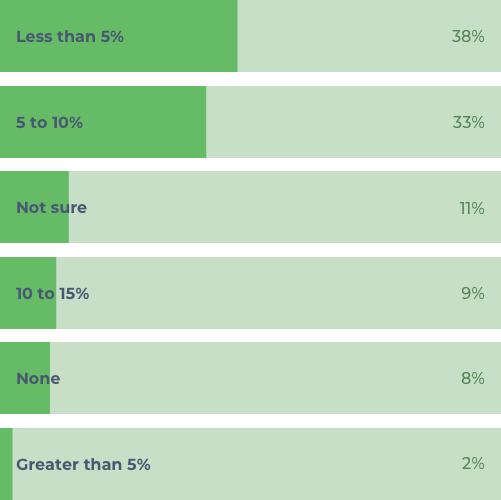 Respondents were asked “how much do you think rent prices will increase in your location in 2019?” The responses were spread out evenly between 0% increase to 10% increase, and “Not sure”. 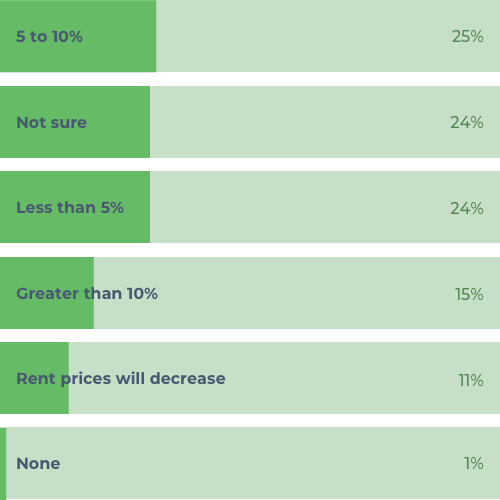 The next level of respondents thought rent prices will decreases. Very little thought rent prices will increase by 10% in one year, which is accurate due to various rent control laws. Responses might be spread out for this survey question because renters are unaware of the current trends of the rental market. Renters do not have easy accessibility to market data as real estate professionals do, therefore, might not have the most accurate predictions. Renters can stay updated on the newest rental trends through subscribing to the free Onerent Blog. 1. Are you planning to purchase another rental property? 52.3% of owners reported they are not planning to purchase another rental property, while 21.6% of respondents reported they have intentions to purchase another rental property. 26.1% reported they are unsure of their future investing decisions. Of the homeowners who own property in Seattle, 4.5% responded “Yes” they have plans to purchase another rental property. Of the homeowners who own property in San Francisco, 11.4% responded they have plans to purchase another rental property. 36.36% of homeowners in San Francisco did not have plans to purchase another rental property. 26.1% of all homeowners surveyed do not know if they are planning to purchase another rental property in the future. 2. When do you plan on selling your rental property? The majority (50%) of homeowners do not plan to sell their rental property, while 37.5% are unsure. 60% of homeowners in San Francisco do not plan on selling their rental property, meaning they intend to hold on to the property for financial investment, move back in sometime in the future, or pass it on as an inheritance to a family member. Around a third (30.7%) of homeowners in Seattle do not plan on selling their rental property. 3. How optimistic are you about the 2019 housing market? 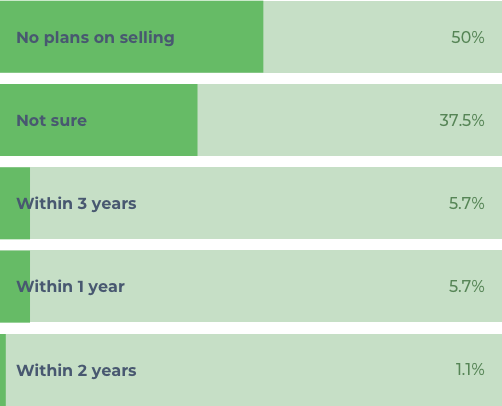 Similar to the previous question we surveyed renters about their optimism levels of the 2019 housing market, we’ve asked the same question towards homeowners. Homeowners averaged a 3.3 on a scale of 1 (Not Optimistic) to 5 (Very Optimistic). Homeowners trended on the optimistic side of the housing market compared to renters who averaged a 2.1 towards the pessimistic side. This relates oppositely to question 4 surveyed towards renters, “Do you think you are overpaying or underpaying for your current rental homer?”, which 68.7% of renters responded they are overpaying for their rental. 4. How much do you expect property values to appreciate in 2019? 35.2% of homeowners surveyed expect property values in their area to increase by 5% to 10%. 9.1% expect a higher 10% to 15% increase. 37.5% expected a less than 5% increase. An increase of around 1% to 5% increase might be more realistic as rental prices begin to cool off heading into Quarter 4 of 2018. We will find out more signs of a slow down or not towards the end of Quarter 1 of 2018 as the holiday season ends and more renters begin to move. Onerent conducted an internal study with proprietary leasing and mangement data. A secondary study was conducted with 200 homeowners and renters who are current and past customers of Onerent. Alameda, Albany, American Canyon, Antioch, Atherton, Belmont, Belvedere, Benicia, Berkeley, Brentwood, Brisbane, Burlingame, Calistoga, Campbell, Clayton, Cloverdale, Colma, Concord, Corte Madera, Cotati, Cupertino, Daly City, Danville, Dixon, Dublin, East Palo Alto, El Cerrito, Emeryville, Fairfax, Fairfield, Foster City, Fremont, Gilroy, Half Moon Bay, Hayward, Healdsburg, Hercules, Hillsborough, Lafayette, Larkspur, Livermore, Los Altos, Los Altos Hills, Los Gatos,, Martinez, Menlo Park, Mill Valley, Millbrae, Milpitas, Monte Sereno, Moraga, Morgan Hill, Mountain View, Napa, Newark, Novato, Oakland, Oakley, Orinda, Pacifica, Palo Alto, Petaluma,, Piedmont, Pinole, Pittsburg, Pleasant Hill, Pleasanton, Portola Valley, Redwood City, Richmond, Rio Vista, Rohnert Park, Ross, St. Helena, San Anselmo, San Bruno, San Carlos, San Francisco, San Jose, San Leandro, San Mateo, San Pablo, San Rafael, San Ramon, Santa Clara, Santa Rosa,, Saratoga, Sausalito, Sebastopol, Sonoma, South San Francisco, Suisun City, Sunnyvale, Tiburon, Union City, Vacaville, Vallejo, Walnut Creek, Windsor, Woodside, Yountville. The survey was hosted by Typeform via email.